Your child must be 5 years old by September 1, 2019 in order to apply for Kindergarten for the 2019-2020 school year. 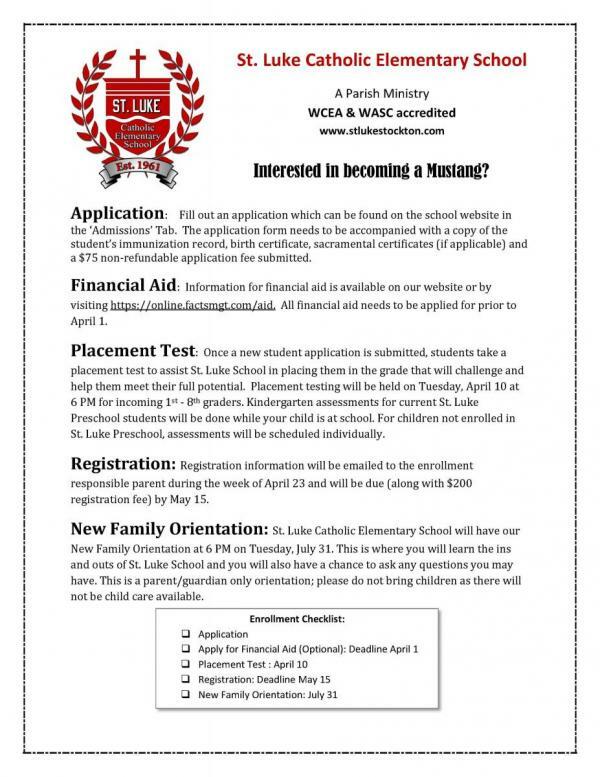 Once a new student application is submitted (1st - 8th grade), students take a placement test to assist St. Luke School in placing them in the grade that will challenge and help them meet their full potential. St. Luke Catholic Elementary School does not discriminate on the basis of race, color, national or ethnic origin or gender in the admission policies of the school, in the acceptance of students into any programs or activities sponsored by or conducted in the school or in the granting of any rights, privileges, scholarships, or tuition assistance by the school.